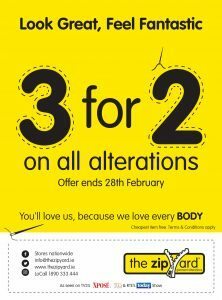 Our 3 For 2 offer on all alterations is available in all our stores nationwide until Wednesday 28th February! To find your nearest The Zip Yard store please visit our Store Locator here! *T&Cs apply. Cheapest item free.